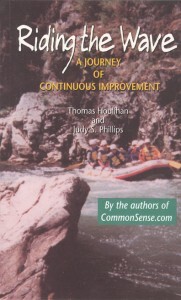 In 2000, these authors published a book called Commonsense.Com [see listing below] in which they told a “fable” about a school superintendent, a principal, and a classroom teacher receiving e-mail instruction from a mentor which enabled them to improve their job performance. In their new book, Houlihan and Phillips use the setting of a whitewater rafting trip to give further instruction using an Aligned Management System. With the Garth Brooks song “The River” as inspiration, the lessons of the raft trip are applied to the processes of school teaching and administration in a lucid and exciting manner. Dr. Houlihan is Executive Director of the Council of Chief State School Officers in Washington, D.C., and Judy Phillips is CEO of the North Carolina Partnership for Excellence which was established in 1997 to help transform education in the state. The authors, both professional educators, tell us this book is about hope. They call their story a fable – but it could happen. If a school superintendent, a principal, and a classroom teacher should all receive an email message one evening from a mysterious person directing them to a website called “CommonSense.com”, this story is what might follow. The three are soon in daily contactwith their “mentor” and with each other about ways to do their jobs better, to teach the students, handle administration, deal with their publics – and make their own careers more successful and satisfying. The North Carolina Partnership for Excellence, of which Houlihan is President/CEO and Phillips is Vice President, was established in 1997 to help transform education in the state. The principles being used are the basis for this fable.